New York: Doubleday & Company,, 1975. Octavo. Original green cloth, spine lettered in gilt, gilt facsimile signature to front cover. In the green slipcase as issued, with printed label on front. With 144 black and white photographs. Spine very slightly faded. An excellent copy. Signed limited edition, number 97 of 400 copies signed by the author. The trade edition was published the same year. Though unmarked as such, from the library of Winston Leyland (b.1940), a leading figure in American LGBT publishing who won the Stonewall Book Award in 1980. 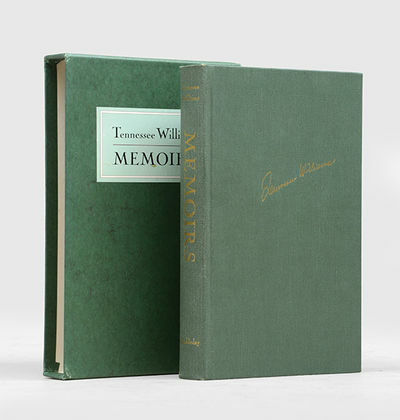 He established the Gay Sunshine Press in 1975, and his Gay Sunshine Journal (1970-82) was particularly influential for its interviews with prominent gay writers of the era, including Tennessee Williams.